This full day tour departs from Central Lisbon at approximately 9 am. Hotel pick-ups will begin up to 1 hour prior to departure time. Attractions are usually less crowded during the winter season. We are comparing Obidos, Nazare, Fatima and Batalha Day Trip Prices from leading ticket suppliers and Try to find you Cheap tickets prices on the market. Meet your guide bright an early, while the city of Lisbon is just waking up an travel out of the busy Portuguese capital to the tranquil countryside village of Fatma, also known as Nossa Senhora de Fatma. A regular site for pilgrims since 1917, you can enjoy free time in the village to wander the quiet streets or visit the Catholic cathedral and Sanctuary of Fatma. Next continue on a breath-taking coastal road to Batalha, the highlight here is the UNESCO protected Batalha monastery, your guide will fill you in on its history and significance to the region, and you'll have time to visit the site and wander through the marvellous 14th-century building. 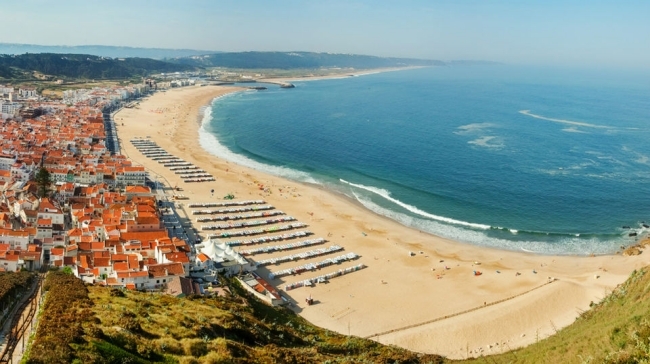 Next, stop in the colourful village of Nazare, stroll through the traditional fishing village or grab a bite to eat. On the way to the medieval town of Obidos you'll have the chance to visit the largest gothic church in the country, the Santa Maria d'Alcobaca Monastery. Take in the impressive façade and stain glass windows and snap some photos before journeying through the Obidos Lagoon and Sao Martinho do Porto. Now you're your day trip is almost at an end. You'll have some time to explore the walled town independently before returning by mini-van to Central Lisbon. This tour is aimed at nature and history lovers and those enjoy scenic road trips because the full day excursion will combine 14th-century towns, UNESCO sites, gothic architecture, beautiful coastline, and panoramic views. This is a small group tour suitable for friends, individuals or families. A large portion of this tour is spent on a coach and so may not be suitable for people who dislike travelling by road. Your Experience With Obidos, Nazare, Fatima and Batalha Day Trip? Escape Lisbon an air-conditioned coach and travel to the picturesque towns of Nazare, Fatima, Obidos, and Batalha. Visit UNESCO World Heritage Sites and impressive gothic style monastery's. Drive through gorgeous scenery on Portugal's magical coastline. Learn about the region from a professional bilingual guide. Benefit from the personal service of this small group tour. What Obidos, Nazare, Fatima and Batalha Day Trip Includes? Entrance fees to Batalha Monastery and Alcobaca Monastery. Round trip transport from Lisbon by coach or mini-van. Central Lisbon – Fatima – Batalha – Nazare – Obidos via Sao Martinho do Porto – Return to Central Lisbon. Travelers Reviews about Obidos, Nazare, Fatima and Batalha Day Trip? This full day sightseeing tour had received over 600 reviews on TripAdvisor and has an overall 5-star rating. Minor criticisms say that the tour is a bit rushed, with a large amount of time spent driving between locations. With so much packed into an 8-hour excursion this is difficult to avoid and, as other comments say, the scenery on the way makes up for the distances. Highlights are the tour guides, friendly and multilingual, and the visits to attractions. Please bring a printed or electronic version of your ticket to show the guide. Refund policy depends on you tour providers policy, all tickets are refundable however Viator will not issue full refunds less than 7 days in advance. Full refund are issued by Get Your Guide up to 24 hours prior to tour date. The tour is available in English, Portuguese, Spanish, or French and may be conducted in more than one language. No food or drinks are included in the ticket price unless specified. Viator has an option to include lunch (extra charge) when making your booking. Collection from your hotel in Lisbon, exact pick-up time will be advised within 24 hours of your reserved tour. If your hotel is located outside of Lisbon city centre please contact your tour provider to organise a meeting point.